Perhaps this story is apocryphal. Is a plane crash into a process facility possible? Absolutely. Does it need to be considered in a PHA or risk assessment? Most would instinctively say “No!” Are they right? Airplane crashes into process plants are exceedingly rare. We’ve searched the literature and only identified three in the United State: One in 1949 in Dallas, Texas, one in 1985 in Kansas City, Kansas, and one in 2016 in Lubbock, Texas. There are undoubtedly others, but they are so rare that they should always be newsworthy. It is hard to imagine that many go unreported. So, with 13,500 chemical manufacturing facilities in the U.S., and 3 crashes into process facilities since the dawn of the jet age in 1949, a historical perspective would give the likelihood of suffering a plane crash at a chemical facility of about 3·10-6 per year. By any measure, that is not very likely. But Doesn’t It Depend on How Close the Plant is to an Airport? Some object that simply looking at the number of crashes into process plants over some arbitrary span of time is an oversimplification. They reason, quite correctly, that the likelihood of a plant suffering a plane crash depends on how close the plant is to an airport. The likelihood of suffering a plane crash not only depends on proximity to an airport, but on several other factors as well. H-P Berg described a method to estimate the likelihood of an airplane crashing into a specific facility. Beyond 10 km away from an airport, the likelihood is a function of the number of flights in and out of that airport, the average flight distance to and from the airport, and the size of the process facility. (The bigger the target, the more likely it is to be hit.). Note: L can be in any units, but it must be in the same units in all three instances. Berg’s method can also account for the weight class of the airplane, the deviation from the landing/take-off axis, additional airports, and whether the aircraft are commercial, military, or other. These distinctions are only necessary, however, when the basic method suggests that the frequency is too high and would benefit from a more detailed (less conservative) analysis. What If the Plant is Really Close to the Airport? We looked at the two major airports in Missouri, where our offices are. For a 250 acre facility located 50 km from Saint Louis Lambert International Airport (STL), where there are 260 flight departures a day (95,000 flights/year) at an average flight distance of 1,200 km, the annual frequency of airplane crashes into the facility is about 1·10-7 crashes/year. A similar facility, located 50 km from Kansas City International Airport (MCI), where there are 170 flight departures a day (61,000 flights/year) at an average flight distance of 1,300 km, can expect an annual frequency of airplane crashes into the facility of about 6·10-8 crashes/year. If the plants were closer to the airports? An identical plant that was 5 km from STL could expect to experience plane crashes at a frequency of 3·10-5 crashes/year. If the plant was 5 km from MCI, it could expect to experience plane crashes at a frequency of 2·10-5 crashes/year. 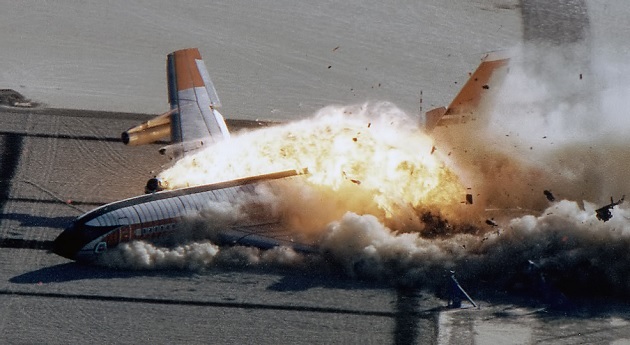 On the list of things we worry about, plane crashes into the plant are near the bottom. This is where your instincts said they should be, and in this case, your instincts are right. However, if your plant is located close to an airport, especially a very busy airport like the major hubs, it may be worth doing the calculations. The data is available, and it is always better to use facts rather than feelings. When the inspector asks why you didn’t address plane crashes into your plant in your PHA and emergency action plan, you can explain that you considered them, and concluded that the likelihood was sufficiently low that your efforts were better spent elsewhere. We couldn’t help ourselves; we checked out Steven Johnson’s statistics. There was a period of four years—2014, 2015, 2016, and 2017—when no one died in commercial passenger flights in the U.S. That streak began on July 6, 2013 after three people were killed in the crash of Asiana Airlines Flight 214 at San Francisco International Airport and ended on April 17, 2018 when one passenger was killed during an engine failure of Southwest Airlines Flight 1380 over Bernville, Pennsylvania. Four dead in less than five years. We still only elect one president of the United States every four years.